I photographed this Black-capped Chickadee on December 8th, 2018, in Mill Creek Ravine Park. My first attempt at drawing this little fella looked pretty good up close, but when I took a step back, he kind of looked off balance, like he was going to fall backwards off his perch. Poop! Sigh. Luckily, a December post by Jean Mackay gave me a little boost and inspiration to try again. I needed to capture the overall gesture of the bird more accurately. No details, just the overall shape. So I decided to sit 2 meters from my laptop with my drawing paper pad in my lap… like faux life drawing. That was a helpful point-of-view! Afterwards, to add details, I put my drawing on the table with my laptop a few inches behind. I started with graphite pencil lines, went over them with a 0.05 Micron pen, erased the graphite, then added colours with colour pencils. I didn’t do much birdwatching in December and only made three bird lists. The longest one had 10 birds and I thought it would be fun to draw all the birds on this list before spring arrives in mid-April. The Black-capped Chickadee was first. I can always count on seeing a few of these cuties, every day of the year. Chickadees are some of my favorite birds. For some reason, whenever I see them and hear them calling it calms my soul. Well said :-). I feel that too. It always makes me smile when the quiet forest suddenly comes to life with the chatter and wing flutters of chickadees. It’s lovely! Great idea about stepping back and looking at your image. It really paid off here. I looking forward to Chick-a-dee’s returning. Thanks, Deborah! 🙂 Sometimes trying new things works out! Serious cuteness! I like your description of figuring out what was wrong and what to do about it, inspired by the fabulous Jean Mackay. 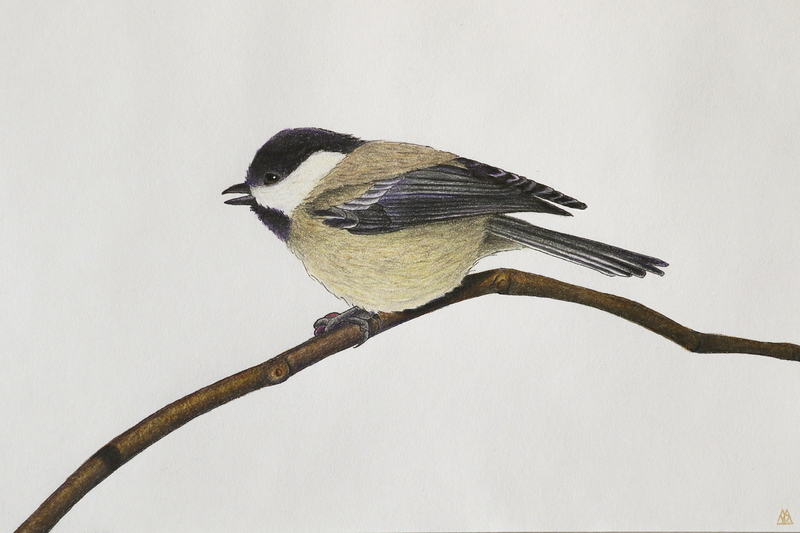 Your drawing looks great, and captures the essence of chickadee. This is the one bird I successfully tamed to come to my hand for food (sunflower seeds of course). I did it as a child, which was an important lesson in patience for that age, and again a few times as an adult. They just always make me feel good, like all’s right with the world. Thanks for appreciating my little chickadee, Lynn. 🙂 Somehow I coloured the back feathers beige instead of grey. My brain works in mysterious ways sometimes! I’m so happy to read that you’ve enjoyed the pleasure of chickadees landing in your hand! I used to do that once in a while in Calgary. They are so wonderfully light! And I liked the look in their eyes – like they were pretty sure that they could trust me but they were just sizing me up a little to make sure. Chickadees and chickadee-like personalities make the world a better place. Oh, it’s wonderful to hear you had that experieince too….there is an energy to truly wild creatures that is completely different from the enrgy humans and our other animal friends have. It felt more high-strung to me, the incredible alertness, and yes, so light, their touch is almost imperceptible. The look in their eyes is to me, never one of complete relaxed trust – like you said they are always sizing up the situation, they can never let go of that ability, can they? I was just listening to a little group of them today (I never fail to smile, at least inwardly, at their voices) while I pulled English ivy out of the ground at a preserve where they’re trying to get things a bit more back to natural – whatever that might be! Good to hear from you!! The ivy can get so heavy on trees that it topples them here! Wow! I had no idea ivy could be such an aggressive plant! I knew it could be really aggressive because I’ve seen it overtake large areas, but I didn’t know it would be so heavy. When you think about it though, it makes sense. Thank you, Myr. These beauties never fail to cheer me up.